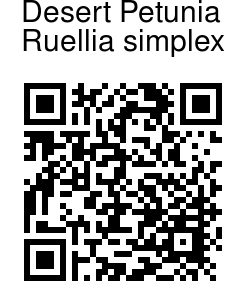 Despite the name, this plant is not related to the usual garden petunia at all - rather, it belongs to the ruellia genus. Desert petunia is an extremely tough, drought-resistant plant with a long bloom period. It is an evergreen perennial herb that forms colonies of stalks standing 3 ft tall, and of indeterminate width. The strong semi-woody stalks are distinctly vertical in aspect and hold attractive dark green, leaves oppositely at the nodes. The lanceshaped leaves are up to 0.5-1 ft long and 1.3-1.9 cm wide. When grown under hot sunny conditions the leaves assume a metallic bluish cast. 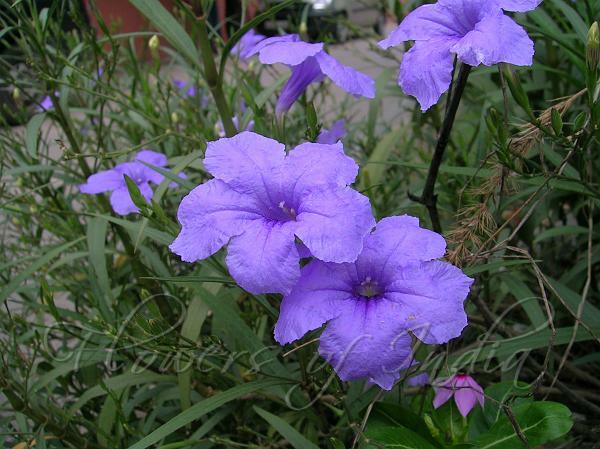 Flowers are blue, trumpet shaped and about 3.5-5 cm in diameter and are borne at the tips of the stems. Varieties with white, pink, and many shades of blue are available, as are dwarf versions that form clumps that are about 8-12 inches in height. Desert petunia is native to Mexico. Identification credit: Dinesh Albertson W Photographed in Delhi & Jaipur.